Visit ProBoard Shop online at ProBoardshop.com for a premier online board shop, specializing in the best name brands for snow, wake, street wear and eyewear. ProBoard Shop has become synonymous with the latest in snow, wake, lifestyle clothing, and accessories. ProBoard Shop's pipeline to the most popular brands means you can come to ProBoard Shop every time for what you want. 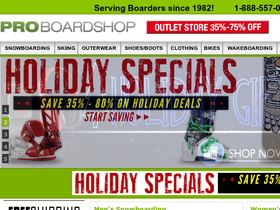 Save money on your next purchase from ProBoardShop.com with ProBoard Shop discounts, ProBoardShop coupons, ProBoardShop promotions and ProBoardShop savings from 58Coupons.com. Use this coupon code on ProBoardshop.com and save 5% off your order. Click link. Check out ProBoardshop.com and get free shipping on your order of $50 or more. Click link to start shopping. Head on over to ProBoard Shop to save an additional 10% on Grenade outerwear with this coupon code. Take an Additional 10% Off All Circa, DVS, and Osiris Skate Shoes at Proboardshop.com with this coupon code. Discounts of up to 85% on Weekly Deals at ProBoard Shop.com. Hurry on over there, items are going fast! Click link to go. Act now to save up to 40% on all Wakeboard brands from ProBoardshop.com. Click link to view. Get a free wakeskate from ProBoardshop.com when you place a wake order of $600 or more. That's a $290 freebie. Click link to shop. Enjoy a free gift pack ($95 value) from ProBoardShop.com when you spend $400 or more in snowboard gear. Click link to view. Purchase a snowboard or wakeboard from ProBoardShop.com and they'll give you a free pair of earbuds or sunglasses valued up to $45.